SOUND FORGE Audio Studio’s interface looks the way you want it to and is fully adjustable with four different hues: Dark, Medium, Light and White. SOUND FORGE Audio Studio combines a familiar ‘feel-good’ audio-editing experience with top quality results. 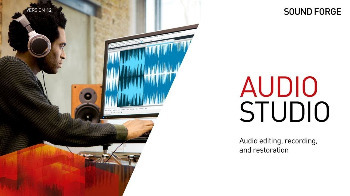 Whatever your audio needs – be they recording, restoration, editing or mastering – it delivers an efficient, speedy and versatile solution.